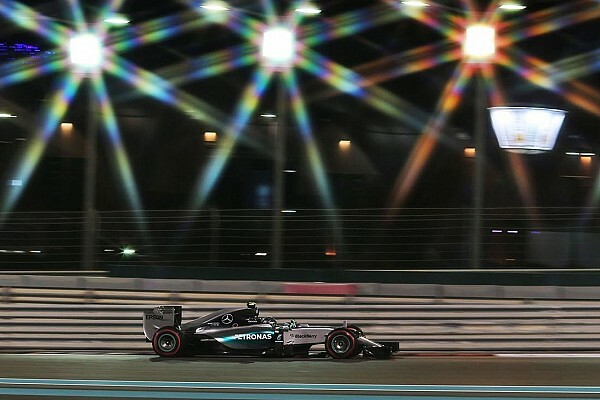 Mercedes led the final two Friday practice sessions of the 2015 Formula One world championship at the Yas Marina circuit in Abu Dhabi. Lewis Hamilton and Nico Rosberg both topped one session each, with Ferrari, Red Bull and Force India all managing to get drivers within a second in both sessions. 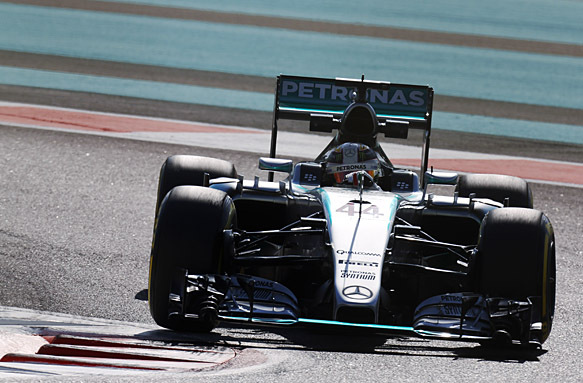 Hamilton held the top spot by just 1 tenth over team-mate Rosberg in the first practice session that was held during the heat of the day in Abu Dhabi. The heat and the time of day made the session largely unrepresentative considering that qualifying and the race will take place during late evening into night. This meant that many teams, such as Red Bull, opted to complete aero testing. Kimi Raikkonen was the closest challenger to the Mercedes drivers; perhaps owing the speed to the temperature of the circuit at the time. He was 7 tenths off of Hamilton and 2 tenths ahead of 4th placed Daniil Kvyat, the second Ferrari of Sebastian Vettel and 6th placed Nico Hulkenberg in the Force India. Daniel Ricciardo was 7th fastest ahead of Sergio Perez and Pastor Maldonado, with Felipe Massa completing the top 10; 1.6 seconds down on Hamilton. Lotus had a shaky start to the weekend after having a late freight arrival that cost them running time in FP1. Both cars eventually managed to make it out on track, with Jolyon Palmer only getting 8 laps in after suffering a water leak. He ended the session 18th in Romain Grosjean’s car. Mercedes maintained their positions at the top of the time-sheets in the much more representative 2nd practice session, but this time it was Nico Rosberg who led Lewis Hamilton by 1 tenth. The pair look set to continue their fight for supremacy as they end the season this weekend. Sergio Perez was in an impressive 3rd place at the end of the session despite the team having to stop the car after a brake-by-wire fault on his Force India; a problem that also affected the Toro Rosso of Carlos Sainz. He was just 6 tenths off of Rosberg and under a tenth faster than 4th placed Daniel Ricciardo in the Red Bull. Sebastian Vettel and Daniil Kvyat were 5th and 6th fastest ahead of Kimi Raikkonen and Nico Hulkenberg. Fernando Alonso was in the dazzlingly high position of 9th in the McLaren Honda after recovering from yet more engine issues in the first session. He was the last driver within a second of Rosberg in P1. Pastor Maldonado completed the top 10.